The cross-country relationship between the relative price level and the relative GDP level is found to be significant and stable for EU member states over the period 1997-2006. The joint dynamics of price and GDP levels tend to gravitate towards the regression line but there is no shorter-term trade-off between fast real convergence and low inflation. 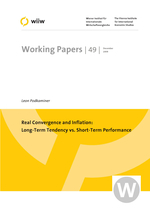 Contrary to popular perception high inflation is not necessary for fast convergence. Moreover the trajectories of certain euro area states indicate that giving up one's national currency is risky: it may stop convergence or even precipitate divergence. Problems may also emerge when the initial parity is weak. In addition, the inability to nominally devalue may prove very costly. However retaining one's national currency is not risk-free, even if domestic inflation is low, and even though subsequent corrective devaluations remain possible. While participation in the euro area has proved troublesome for some countries, it is in the interest of all member states to deepen wage and fiscal policy integration in order to help overcome the stagnation experienced in those euro area states that suffer from strongly overvalued price levels.